Pushwoosh Wordpress Plugin is Out! It’s finally here. Today we present a Pushwoosh WordPress Plugin, which lets you send push notifications along with new posts and pages published on your website. That’s all! 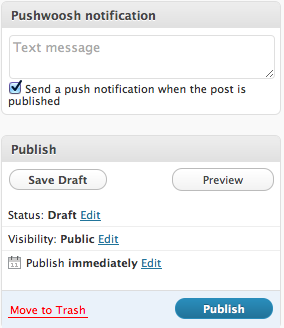 Now you are ready to send push notifications with WordPress. How does it work? It works like a charm. You can enter the text to be sent as a push notification when this page is published and make sure that you have checked the option to send your message. If you save your page as a Draft, your message will be saved as a part of it, and you can decide whether you would like to send your push notification later. If you have a Cron script that allows you to publish your pages as Scheduled, the push notification will be sent along with the scheduled page.